The time is ripe for a Democracy Movement to emerge. The period from 2016 through the 2020 elections will be a critical stretch for reviving democracy in America. At least during this time-frame, a defining issue for our nation will be: Can the American people come together, stand up to Big Money, eliminate the corrupting influence of money in politics, and build a truly representative democracy in the United States before the economic elite has virtually total control of our country? That is, can we, the people, build a successful Democracy Movement and turn our country around? 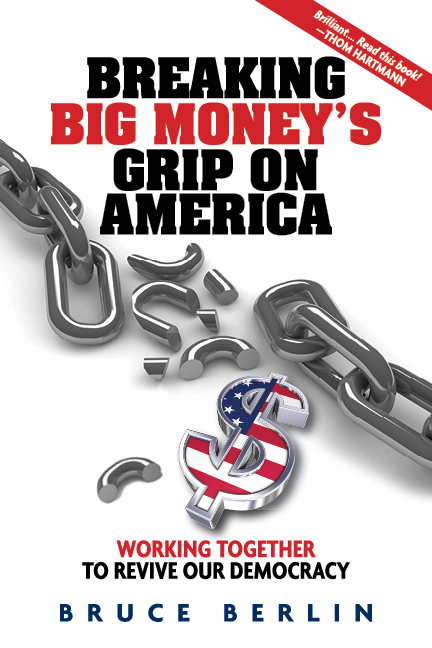 Chapters 8 and 9 of Breaking Big Money’s Grip on America offer a detailed strategy for developing the Democracy Movement. Millions of Americans are angry and appear ready for fundamental changes in our political system. An important focus of the emerging Movement will be to persuade a great number of disaffected Americans that their participation in the political process will make a transformative difference. Two core issues that can bring Americans of all political persuasions together are: political equality—the extent to which citizens have an equal voice in the election process and governmental policy making—and the elimination of government corruption. Polls indicate that between 70 and 80 percent of Americans support eliminating super PACs and overturning the Citizens United decision, both of which would greatly reduce the influence of money in politics. 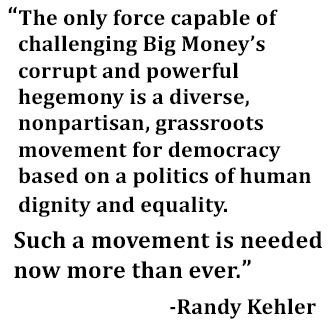 The mission of the Democracy Movement would be to remove the corrupting influence of money in politics and make the government work for all the people of the United States. Establish mandatory public financing of all congressional and presidential elections. Enact a constitutional amendment to reverse the Supreme Court’s Buckley v. Valeo, Citizens United, and McCutcheon v. FEC decisions finding that money is speech, corporations are people, and restrictions on campaign contributions violate the freedom of speech. Reform and strictly regulate lobbying so that all Americans have equal access to their elected officials regardless of their income, corporate position, or labor affiliation. Eliminate the gerrymandering of congressional districts so that each state’s delegation to the House of Representatives is proportionate to the votes each party receives in that state’s elections for Congress. Enact a constitutional amendment to eliminate the Electoral College so that every citizen’s vote for president carries the same weight and the president is elected solely on the basis of the national popular vote. Establish a national Bill of Voters’ Rights guaranteeing all citizens of the United States an equal opportunity to vote and eliminating restrictive voter ID requirements and other efforts obstructing people’s right to vote. These are fundamental changes to our political structure that will be very difficult to establish. But strong, bold actions are required to fix our broken system and put control of our government in the hands of the people. Consequently, the Democracy Movement will need to create an aggressive, comprehensive strategy for pursuing its agenda. Three essential elements of a comprehensive strategy are organization, education and training, and mobilization. While Breaking Big Money’s Grip on America provides details regarding each of these components, the lifeblood of the Democracy Movement would be local Democracy Organizing Committees, or DOCs — an appropriate acronym for those working to revive our ailing political system — in towns and cities across the nation. DOCs should be nonpartisan and diverse, comprised of representatives from business, civic organizations, education, government, labor, minorities, and religious groups. They would consist of community leaders, liberal, moderate and conservative, who put the common good and well being of our country ahead of any political affiliation they might have. They would be civic-minded individuals committed to breaking Big Money’s grip on our government and reviving democracy in America. Their primary concerns would be eliminating the corrupting influence of money in politics, developing political equity so every citizen has as equal a voice as possible, and creating a political process in which our policymakers are accountable to the people and the public interest. The main roles of the local DOCs would be educating the people in their communities about the movement’s mission and goals, organizing and mobilizing volunteers, advancing the movement’s agenda, and recruiting and supporting candidates for state and federal office who strongly back the movement’s mission and goals regardless of party affiliation. A national network of local DOCs would create a dynamic, grassroots Democracy Movement to revive our democracy by engaging millions of Americans in participatory government. Setting the stage for a bigger, more effective campaign to break Big Money’s grip in the 2018 election cycle. Most importantly, your active participation is essential for the Democracy Movement to succeed.